Tim Stansbury & Erin Whalen came into the Shark Tank looking for 40k for a 40% stake in the Grease Monkey Wipes Business . Erin explains that during one of their 100-mile bike rides together she ended up getting a flat tire. By the time Whalen was done, Her hands were covered in grease. As they continued their bike ride they started brainstorming of a new portable cleaning product that could easily and conveniently take away grease and dirt while on the go. Erin pulls out some conveniently packaged Grease Wipes and passes them out to all to the Sharks. Tim Stansbury then starts to explain that each individual wipe is a natural, non-toxic, citrus-based cleaner to handle heavy duty cleaning. He then explains "these are not your ordinary cleaning wipes but are specifically made for much tougher cleaning jobs". It's time to get a little greasy when Whalen pulls out an ordinary wet wipe and tries to clean her hands full of engine grease. The wet wipe moisturizes her hands but does little to remove any of the greases. Her hands are still stained when Kevin O'Leary says "that's nasty". Whalen then grabs a Grease Monkey Wipe and almost miraculously the Grease (and the stains) disappear. They then demonstrate their wipes on permanent markers, paint, and even crayons and they are all wiped off with very little effort. Kevin O'Leary seems rather intrigued and asks if they have a patent for the Grease Money Wipes. Stansbury explains if they had a patent they would also have to disclose the actual "natural ingredients" they have perfected and he is not too excited to give this information to potential competitors. Kevin Harrington asks "doesn't this product already have a lot of competition in the industry"? Robert Herjevic actually answers the question for Tim and Erin when he says " most of the products specifically made for tougher grease type cleaning jobs are filled chemicals, whereas the Grease Monkey Wipes are all natural, non-toxic and they smell good". Keven O' is the first to start talking about sales. Stansbury says they have only been in business for a few months and have already sold over 7,600 wipes for a total of $7400 in sales. Kevin wants to know if that's a sustainable business selling individual wipes for almost $1 each. They both agree, that yes it is very sustainable and we'll worth the price when you really need one. The market potential is enormous in many fields for a convenient heavy duty cleaning wipe such as theirs. They have had great success just in the niche bike market with a 75% success rate in the bike shops they have shown this to. The Sharks like the idea and the presentation but they all have reasons not to invest in the company. All of them but Robert Herjevic who is seen doodling some numbers and almost waiting for the other Sharks to get out of his way. Erin starts looking maybe just a little worried at this point and looks at Robert with a look that would be impossible to say no to. Walen then says "I promise if you partner with us, we won't let you down". Robert is impressed as says "they are the Real Deal". Robert is still on the fence thinking if he can bring enough to the table to make money with the Grease Monkey Wipes. He asks Erin to give him a good reason to invest with them in one sentence. She promises him again, they will make Monkey Wipes a fantastic successful national brand. He finally agrees to give them exactly what they are asking for without any negotiating. Barbara Corcoran is stunned. She says she was just to go back in and make an offer. Corcoran asks Herjevic if she could come in for half the investment? Robert agrees and together now control 40% of the Grease Monkey Wipes for only $20k each. As Tim Stansbury & Erin Walen were leaving the room Daymond John says "Wow- I was also about ready to jump back in the deal". The more Tim and Erin explained the product, the more the Sharks were eating it up. If Erin and Tim had a little more time they potentially could have made a deal with all the Sharks. No Doubt this is a Great Product and will be sold internationally in record time. Tim Stansbury and Erin Walen probably had very little idea how successful the Grease Monkey Wipes would become so soon after the show. With the help from Barbara Corcoran and Robert Herjevic, they are indeed on their way to make this a national brand. The product is selling so fast they were invited back to the Shark Tank in Season 2 as the Success Follow-up Story in week 5. 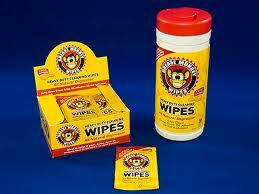 They took the product from 40 stores to over 500 stores within that time and sold over 200,000 Monkey Wipes. What began as a hobby is now a very successful full-time business for Stansbury and Walen. Wrong answer. Just like WD-40 has never patented their formulation, the Grease Monkeys shouldn't either. You really should stay away from topics you have no knowledge of. I don't understand. Why wouldn't it make sense to patent and protect this product? Yes, it was Barbara that went in on the deal with Robert but also as the couple Walen was leaving the room Daymond John said "Wow- I was also about ready to jump back in the deal". It wasn't Daymond. It was Barbara Corcoran. People wondering why they didn't patent their formula: The patent requires disclosure of the formula. And a patent only protects you if you catch infringers and prosecute them. In cases like this, it would take a LOT of expensive legwork to prove that the patent had been infringed, so it actually makes sense for them to keep the formula a closely guarded trade secret, rather than giving up the formula and losing the market to low-cost patent infringers, who would multiply like cockroaches: swat one and another just pops up. Great explanation. That is why Coca-Cola will never patent its formula! Ultimately, you should ask your sharks about the possibility of getting NASCAR sponsorship and eventually get that grease monkey on the hood of a NASCAR race car! If you can do that you'd be internationally known instantly. Then go after a cycling sponsorship in the Tour de France! Motorcycle sponsorship in moto GP also. Maybe start small and get into local drag races. See if you can sponsor a local and get that grease monkey on a car hood. I think they should of trademarked it .Like coke it is not a patent product because they did not want to give up their intellectual properties. They did trademark their logo! Did you not watch the episode? Pay attention next time dude! Good Lord! I think you should pay attention. First: they did not trademark their logo, they patented it. Its different. And 2, they are referring to the wipe, not the logo. Nobody cares about the damn logo, we are here for the product. Which they didnt patent for reasons. Wrong. They did trademark the logo. You dont get a patent on a logo. You trademark it.